Help your best friend be their best self with Purina Pro Plan Focus Digestive Health Chicken Dog Treats. 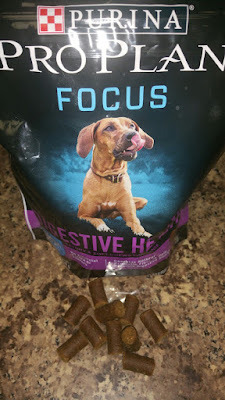 These soft, delicious treats feature real chicken as the very first ingredient for a delectable flavor she’s sure to love, along with pumpkin and natural prebiotic fiber to help promote digestive health. The easy-to-break treats deliver complete and balanced nutrition that’s perfect for training your dog or simply giving them a delicious reward for being your loyal companion. Crumbling these soft, savory treats over dry kibble can also help entice a picky eater to gobble up their dinner! Both pups will sit at attention and wait patiently for these tasty treats! Not only are these dog treats perfect for any size dog as a daily treat, they would also be great for training. Some people might not think to mention the bag these treats come in, but I must tell you that the bag is also great! It is thick and durable, and has a re-sealable zipper top!